This post brought to you by FrogTape®. The content and opinions expressed below are that of More with Less Today. 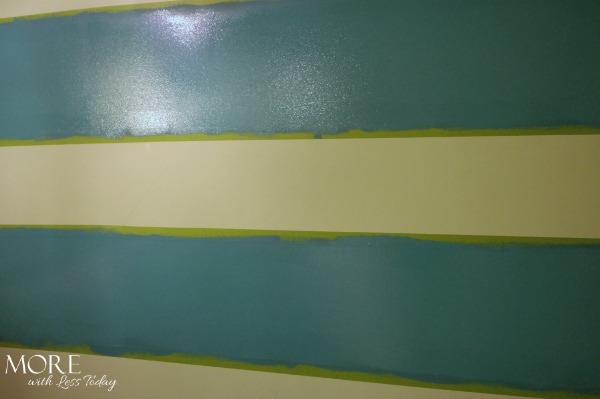 I was recently asked to be part of the Earn Your Stripes Room Makeover Contest with FrogTape® brand painter’s tape and the timing could not have been more perfect! We’ve been wanting to do a total room redo on my daughter’s bedroom for some time. When we moved into our home 2 years ago she took a bedroom that was painted with a color that “worked” and she didn’t mind it but she is turning 11 this week and her personality is really starting to show through. She was ready for a big girl bedroom and something that reflected her likes! While it’s important to us that the theme and colors will grow with her we also wanted to do something really fun. She was away for a couple of days and we surprised her with a total room redo when she came home and she loves it! FrogTape® brand painter’s tape sent me samples of 2 of their best products, the Delicate Surface and Multi-Surface tapes. 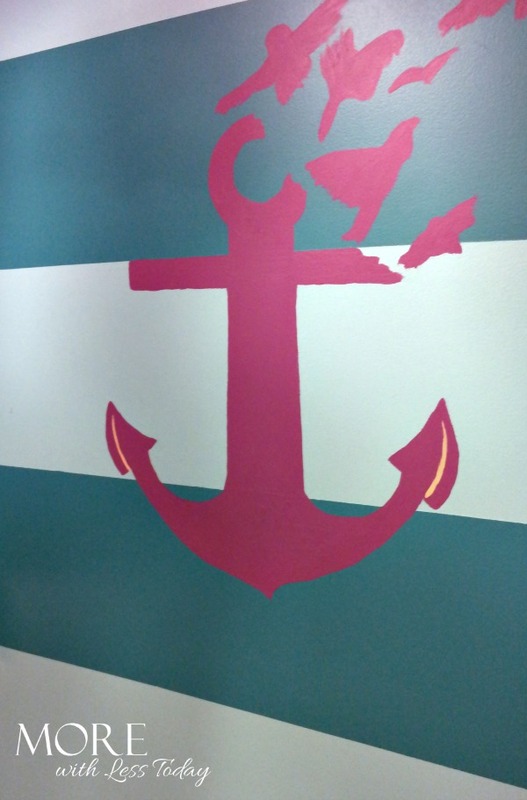 FrogTape® is the only painter’s tape treated with PaintBlock® Technology. PaintBlock is a super-absorbent polymer which reacts with latex paint and instantly gels to form a micro-barrier that seals the edges of the tape, preventing paint bleed. 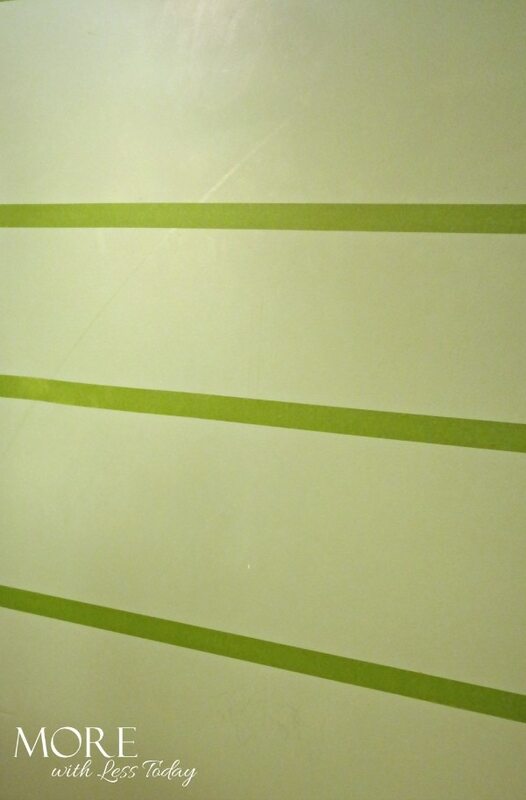 This means that whatever your paint project is you can count on FrogTape to deliver clean, crisp lines! This was important for my daughter’s room redo as we planned to paint stripes on her walls. We were working in a pretty tight time frame as we tried to complete the project in the short time she was away from home. We had to paint the walls and add the stripes all in the same 24 hours. This meant having to tape off freshly painted walls. I was really worried! My past experience with taping fresh paint had left me feeling less than confident after much of my fresh paint pealed from the wall with the tape. The Delicate Surface tape from FrogTape® is a low adhesion painter’s tape designed for use on fresh paint (24 hours old) and boasts that it will remove cleanly! I really put this tape to the test, taping my fresh paint at exactly the 24 hour mark. When I removed the tape after adding my stripes I was thrilled to see perfect lines with no bleeding and no damage to my fresh paint! I loved that this product helped me to complete my project quickly for a great birthday surprise. Both the Delicate Surface and Multi-Surface tapes went on and removed easily. The tape sticks well to the wall but was easy to lift off and move when I realized that I didn’t have my stripes on straight. In past painting projects I’ve had trouble moving other paints and found that it led to even more bleeding than normal. With FrogTape there was no bleeding even after having to move my tape a little! 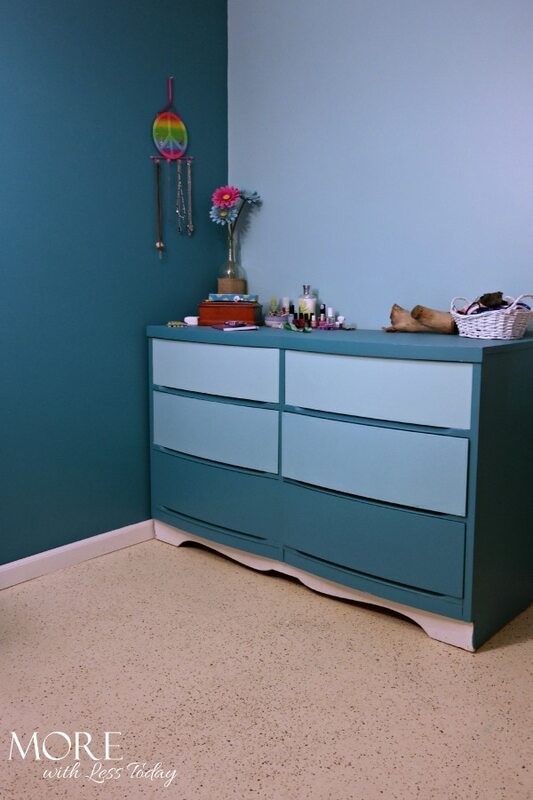 We also used the FrogTape to turn a boring white dresser ombre in the same ocean colors of her walls. This was one of my favorite parts of the project. We created a hanging bed for her and I painted some extra details on the walls like the anchor breaking into birds and the infinity rope above her bed. We still have a lot to do to make the room complete but the painting was the biggest part and had the most dramatic impact! I couldn’t have done it so well or so quickly without FrogTape. FrogTape® wants to Reward Your Creativity with their Earn Your Stripes Contest. Re-do a room with the help of FrogTape and submit your photos to the contest site here: Earn Your Stripes Contest . Show FrogTape® your most creative painting project and you could win $5000! Get more FrogTape® painting inspiration and find out more about FrogTape® products by visiting and following their Twitter (@FrogTape) Instagram (@FrogTape), Facebook, and Pinterest pages!